The University of New Brunswick is studying earthquake activity in the Maritimes thanks to the recent purchase of a seismograph. Seismographs record the arrival of seismic waves from earthquakes by measuring voltages generated when ground movements cause electrical coils to move relative to magnetic masses suspended on springs. UNB alumni may recall an old seismograph that was installed on campus near the Science Library as part of the Canadian National Seismograph Network until the mid-1990s. That instrument, with its classic pen-on-paper drum recorder, was retired when its technology, together with its location in the midst of a busy campus, rendered it unable to meet increasing standards for data quality. Through generous donations to UNB, contributed by the McLeod family of Vancouver and alumnus Graham Farquharson, and UNB staff efforts, the university has purchased a new observatory-grade instrument. Faculty and students are in the process of commissioning it this summer. Data are already being collected at a temporary station and being relayed over internet connections to both UNB Fredericton and Earthquakes Canada in Ottawa. 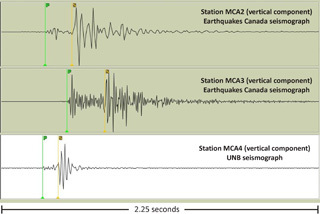 Coincidently, UNB has been working with Earthquakes Canada seismologists to study unusual earthquake activity in McAdam, New Brunswick since mid-March. UNB’s new instrument is temporarily stationed there along with two others from Ottawa in an effort to understand the seismic source. “McAdam has experienced at least 30 small seismic events, constituting what is known as an earthquake swarm” Butler says. “Following an early flurry, the earthquakes have become more sporadic since mid-April, but there have been some occurring as recently as mid-June.” Although small in size (the largest had a magnitude of 2.4), the events have been unnerving for residents who described them as sounding like explosions. Monitoring has revealed that the quakes are occurring at very shallow depths, directly under the town, explaining why the seismic waves are sufficiently high in frequency to be heard as much as felt. A permanent site for UNB’s seismograph, in a quiet location on bedrock, is being sought in central New Brunswick, where Butler notes there is currently a gap in the Canadian National Seismograph Network. Sites near Minto and Mactaquac are both under consideration. Butler says that either location could serve as a good bedrock reference site for estimating seismic wave amplification effects that are known to occur in the thick soft sediments of the St. John River valley. These amplification effects - the subject of a recent Team Design Project by UNB Geological Engineering students – increase seismic risk in downtown Fredericton as evidenced by the swaying of buildings that occurred there during the magnitude 5.8 Virginia earthquake of August 23, 2011. Jessie Brown, a third-year undergraduate student at UNB, was the recipient of a National Science and Engineering Research Council award, and is interning with Butler’s team. She is helping to set up software for operating the seismograph and displaying its data to campus, and is also participating in analysis of the McAdam earthquake swarm. “Ultimately, we hope to have the seismograph project set up in such a way that we can bring the data into classrooms to show students examples of what’s coming in right now and examples of earthquakes that have been measured at Fredericton,” says Butler. Having a live feed from a seismograph on display within the Quartermain Earth Science Centre, Butler says is a great way of showing people that the earth is always moving.